NEW YORK (CNNMoney) -- Before you know it your car will be rolling off the assembly line looking more like a smartphone -- making dinner reservations, searching the Internet, and of course, texting and making phone calls. That's good news for young drivers who seem to love their phones more than their cars. But keeping up with the latest technology craze and ever-evolving gadgets may cause automakers major headaches. On average people keep their phones for about two years before hopping on to the next gadget. Car owners on the other hand tend to keep their rides for about five years, an eternity, relatively speaking. Then the cars live on with second and even third owners. Generally, the total lifespan of a car after all its owners is about 10 years, according to Polk, an auto sales research company. "One of the things we've been wrestling with for a long time is the lifecycle change between consumer electronics and vehicles," said Jim Pisz, corporate manager for advanced technology at Toyota Motor Sales, USA. This challenge has thrown major automakers like Toyota (TM) and Ford (F, Fortune 500) into bed with software giants like Microsoft (MSFT, Fortune 500). Also, relatively obscure companies are among the many that are now benefiting. Among them is Airbiquity, a company that creates ways to pass data across cell phone connections. Automakers are even working with Internet radio companies, movie ticket websites, and legions of independent mobile app creators. Keep it simple: The secret to operating in this ultra-fast world, according to both Toyota and Ford, is to make the interfaces as simple as possible, while relying on downloads and the driver's own smartphone as much as possible. Toyota's Entune system is basically a tablet computer installed in the dashboard that displays a few Internet applications the driver can use. The system will debut on the Toyota Prius V, a new, roomier version of the Prius due out later this year. "All five applications we deliver are on a server in Seattle," Pisz said. For now, those applications include Pandora and iheartradio Internet radio services, Bing search and OpenTable for restaurant reservations. The advantage of putting everything on one big server instead of in the cars themselves, said Pisz, is that Toyota can change or update the applications without the driver having to download or install anything. "Fast forward to, say, 2014 and you buy a used Toyota with Entune and whatever apps are relevant in 2014, you get," Pisz said. Plus, Toyota's technology allows the automaker to control what applications drivers have access to. No watching YouTube or filing your tax return from behind the wheel. Even Toyota's Internet connections aren't built in. Using Bluetooth, the car relies on the driver's smart phone for Internet access. That simplifies billing -- the car doesn't need its own data plan -- and it also means the car's Internet connection improves with every new phone. Ford Motor Co. has taken a similar approach with the latest version of its Sync system, due to come out soon in the Ford Fiesta and Mustang. 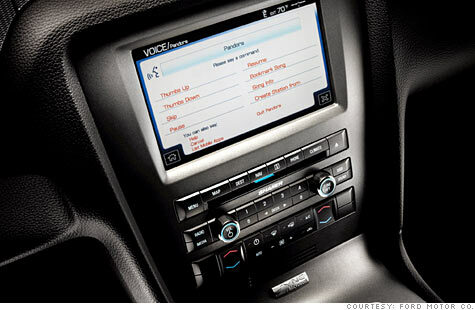 Ford has made it possible for outside programmers to design smartphone applications to work with Sync. The applications stay on the phone, not in an onboard computer or a remote server. They'll be controlled by the driver using voice commands or a few simple buttons on the car's eight-inch computer screen. "We don't want you, while you're driving, to have to fish for your device," said Jim Buczkowski Ford Motor Company's director of advanced research and engineering. Not only are applications downloadable, improvements to the Sync system itself -- new functions, or improvements to the way the interface works -- can be downloaded on a home computer and carried to the car on a thumb drive. More complicated software upgrades might require a visit to the dealer. Even the hardware is designed for easy upgrades, Buczkowski said. The array of USB plugs, Secure Digital card slots and A/V jacks is designed to pop out as one piece to be replaced with, say, something with more USB ports or even with a slot for some as-yet-uninvented memory device. But most of the hardware, he said, probably won't need to change. "Buttons don't change," he said. "Features and functions change, buttons don't need to." Carmakers better hope that's true or risk looking dated as they try to stay ahead of the cool-tech curve.